Hank Greenberg was born on New Year’s Day 1911, 104 years ago yesterday. People have in rare occasions lived that long, but Hank Greenberg wasn’t one of them. He died in September 1986, a few weeks shy of the night when Mookie Wilson hit a groundball up the first base line toward Hank Greenberg’s fellow first baseman Bill Buckner. Bill Buckner played 22 years in the majors and went to an All-Star game and won a batting crown, but one moment will outlive all others for him, and will almost surely outlive him too. By contrast Hank Greenberg had one of the shortest careers of anyone in the Hall of Fame, logging just seven seasons with more than 500 at bats. He lost most of one year, 1936, to injury, and lost three full seasons and large chunks of two others to World War II. Had his playing career not overlapped with the war, he could have easily flirted with 500 home runs, which for much of baseball history—but no longer; now it’s a conditional number almost as prone to prompt suspicion as admiration, let alone hallowing—has been a mark guaranteeing immortality. Should I put quotes around that last word? It’s a strange word to use. But it’s bandied about in sports discussions, especially with baseball, which is perhaps one of the reasons why discussions about who should or shouldn’t be in the Hall of Fame get so heated. Immortality is at stake. Everything dies; what survives? 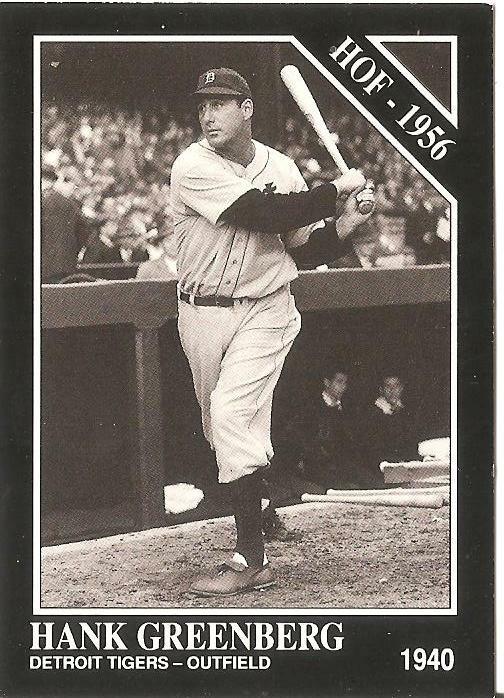 The back of this card was not given an effective quality assurance check at the production stage—the block of text beneath Hank Greenberg’s statistics is cut off. The last line reads, “One of his top career thrills was a pennant-clinching grand slam home run against the Browns in the ninth inning of the final game of the 1945” (no end punctuation, no additional text). I know about this moment because of the headline for the 1945 season wrap-up in the Neft and Cohen baseball encyclopedia that I virtually memorized as a child: “Greenberg’s Grand Return.” It is probably the headline most indelibly marked in my memory. I came to understand the notion of time and civilization through that encyclopedia. I thought of the encyclopedia itself as immortal, but a few years ago, perhaps because of all the similar information now available on the internet for free, that encyclopedia was discontinued. I wonder about the person responsible for the quality of this baseball card, the person, in other words, who didn’t notice that the last line of text was cut off. He or she was probably busy, thinking of other things. I wonder about the two figures lurking in the dugout on this card. You can barely see them, just two blurs for faces, white collars. The rest is already gone. We’re like these peripheral figures hovering in and around the front and back of a baseball card, our lives a blur, a series of oversights. We want to believe in something towering forever above this. You are currently browsing the archives for the Hank Greenberg category.